Announcement Robot charms are built with lead-free solder using electronic components salvaged from discarded TVs and VCRs. 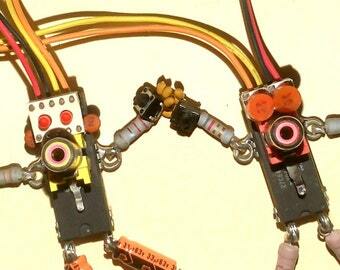 Robot charms are built with lead-free solder using electronic components salvaged from discarded TVs and VCRs. Fun item! Long-time lurker, first-time buyer here. Prompt communication & shipping. Item safely packaged. Kind, thoughtful customer service. I am obsessed with these robots. Each one is a piece of art. I have multiple charms and purchased dozens if them for gifts. Anytime I wear one It becomes a conversation piece for all generations. These are so cute and clever--wonderful work! also thanks for the surprise bonus bot and photo cards, really made my day. Thank you for being a pleasure to do business with! Thanks for visiting the obviousfront Etsy store. I've been building these robots since 1982 and still enjoy finding new designs. Capacitor Robots are built with lead-free solder using electronic components salveged from discarded TVs and VCRs. Legend has it that hanging a Capacitor Robot by a computer will prevent crashes. Let me know if there's something you dislike about your order and we will work things out. I stop at the USPS a couple times a week. If it takes more than a week to ship your order I will include an extra charm, no charge.